First,let me thank Allah swt for His Grace that my Brompton bike arrived just in time- a day before my birthday i.e two days ago.And,together with another Brompton owner,we rode our maiden ride last night with our riding buddies.There were 13 of us last night and as usual after burning some 600+calories we went for supper at Umai Cafe.I brought a dozen muffins for my buddies to celebrate the occassion. This is a folding bike,quite suitable for senior citizens like me to ride either for commuting or for easy exercise like 15km ride around Putrajaya.Last night,a 10 year old girl came with her father and managed to ride with us for 13km.By the way,she rode a Dahon folding bike.We went up to PICC and all of us can make it. Today our PM is riding with another 1000 riders in Kuala Lumpur.Cycling is a great equaliser-no matter who you are,a king or a llabourer,one has to pedal the bike to keep moving to the desired destination.Why not join me or your friends cycling to keep fit and healthy,insyaAllah. Saya cadang beli di Jakarta.Di KL lebih mahal.Beli di London lebih murah lagi. 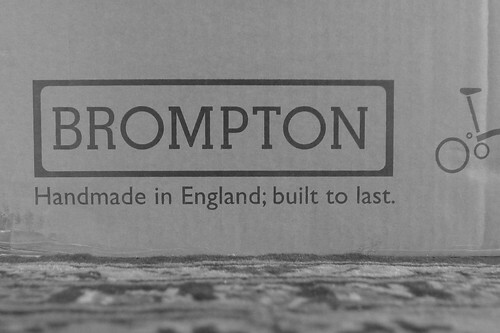 Mohon information dimana kalau di Malaysia mau beli accessories Brompton? Bagaimana perbandingan harganya dengan di Jakarta? Maaf saya tidak tahu harga di Jakarta atau di Malaysia.